High quality acrylic facade paint with high coverage power and easy to apply. Baumit ProColor is an organically bound and processing finished paint for interior and exterior usage. Baumit ProColor is extremely water-repellent, weather-resistant and permable. Additionally, it is easy to clean and easy in processing. 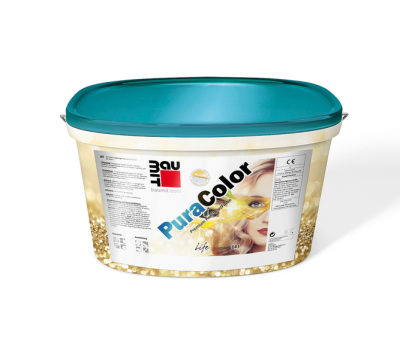 Baumit PureColor is suitable for application to mineral and organically bound plasters as well as on fillers and concrete. Apply façade paint to the dry, clean substrate in two steps. Make the prime coat by the diluted paint Baumit StyleColor with 10 – 15 % water. After approx. 12 hours, depending on climate conditions, apply the second coat of undiluted paint using a brush or roller. If needed, the consistency of the paint can be adjusted using a small amount of water (max. 5 %). Are you looking for a specific color?